This case was designed for Volt Lights to hold 8 Leko light fixtures with clamps attached. 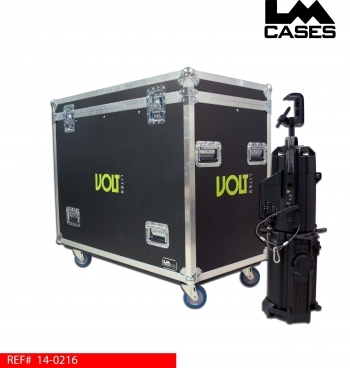 The exterior cases dimensions are based around a 96” truck pack. The case features an all 1/2” Marine Grade plastic divider network. The lights ride on a 2” PE foam block with a 1/4” Marine Grade plastic board laminated on top to prevent the end of the light from digging into the foam. 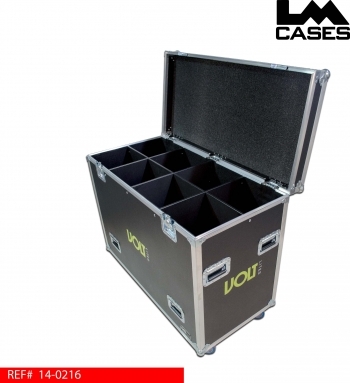 The exterior case is built out of 3/8” plywood and features, stacking caster wells, 4” Colson casters, 8 deep recessed handles and a route out for a PAL label in the lid. Special thanks to Volt Lites!